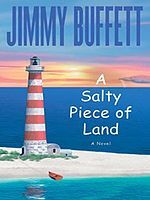 A Salty Piece of Land by Jimmy Buffett is a book that has been around for a while, but I think it deserves a little attention. Well it got attention when it first came out, but anyone who likes Jimmy’s music, and enjoys a fun book to read should take a look at this book. A cowboy names Tully Mills decides to spend some time in the tropics relaxing. He brings his horse with him, and his adventures soon begin. And he finds out that you never know who you will meet or what will happen while you are in the tropics. Throughout the book Tully takes what life has to offer with a calm attitude, and he develops really great relationships with most everyone he encounters. And the book like Buffett’s music is down to earth and fun to read. I listened to the book on audio, and there was an extra perk by doing this. Jimmy Buffett’s song A Salty Piece of Land was included with it. The song is about the story in the book, and it is an excellent add on to a book full of adventure.